If, like me, it can take you forever to decide which bath oil or gel to use in the bath, here is a great gift set (for yourself or a friend) that has plenty of products for you to choose from – depending on your mood and the sort of day you’ve had, making it the ultimate 24 hour body care kit. The Elemis Bath and Body Jewels has two shower gels in the set – skin nourishing to unwind and revitalise-me to wake up – both of which smell fantastic and really help you to nourish or to invigorate your energy respectively. If you opt for a bath, there is also a choice of two bath elixirs, the quiet mind relaxing bath elixir with patchouli and eucaliptus and the tranquil touch with cedarwood and vetivert. Both of these bath soaks are especially soothing, my personal favourite being quiet mind because it reminds me of being in a spa. To finish, you have the choice of two moisturisers: a skin nourishing body lotion that is very enriching and a tranquil touch body cream from their exotics collection that is fragrant and nourishing. If you’re not familiar with Elemis, this is a great way to get to know the brand, and the size of the products (100ml each) makes them ideal to take travelling in your hand luggage or handbag. The packaging is gorgeous and very good value at under £30.00. 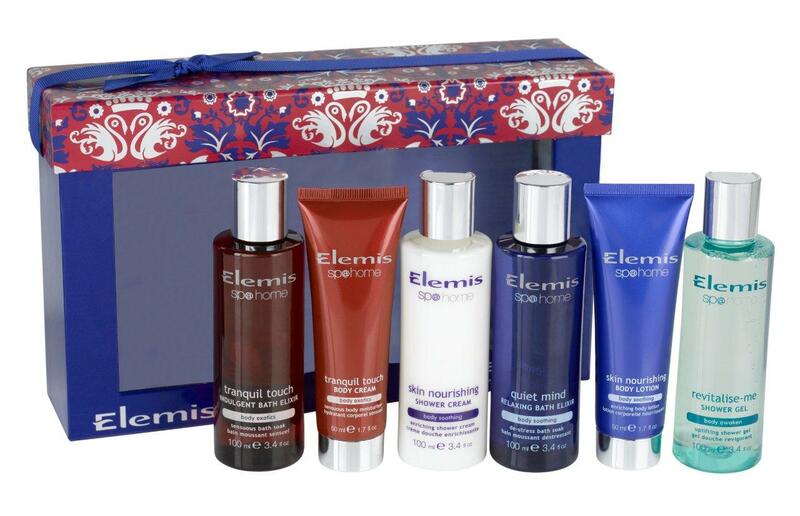 The Elemis Bath and Body Jewels is priced at £29.50. For more information go to www.timetospa.co.uk. This entry was posted in Bath, Body, Skincare, Wellbeing and tagged bath and body, Bath and Body Jewels, bath elixir, body lotion, elemis, shower gel. Bookmark the permalink. Hi! Someone in my Facebook group shared this website with us so I came to check it out. I’m definitely loving the information. I’m bookmarking and will be tweeting this to my followers! Superb blog and outstanding design.